We were very curious about this particular ceiling light under our magnifying glass. For measuring its PAR values. Sure we’re talking about a completely blue ceiling light, so it will be difficult to put in the right light the values that we’re going to collect. But we know that soon we’ll have also a white lamp to test. 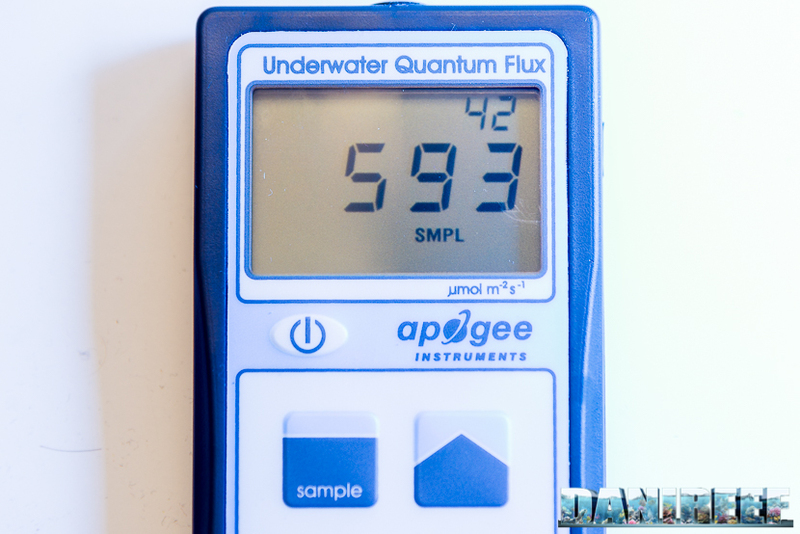 We began measuring the PAR, expressed in PFFD that is the photosynthetic photon flux density in μmol m-2 s-1 through the best device on the market, the Quantum Meter MQ-510 di Apogee. This device is calibrated in order to work underwater, so if used in air the measured value has to be divided by 1,32 that’s the diving factor. We have to make the conversion. We made just one measurement at the middle of the ceiling light. In uniformity with the measurements that we’ve done and that we’re going to do, we were 20 cm away from the ceiling light. We also measured the absorbed power. As you can see from the reading of the device, we detected 593 par, and divided by 1,32, we obtain a result of 449 μmol m-2 s-1. The total consumption of the ceiling light is 78,85 watt as you can see in the picture below. While the Cos(fi) reported an enviable value 0,97. In the following chart we reported the measured values. There is only one channel, so there’s only one line. 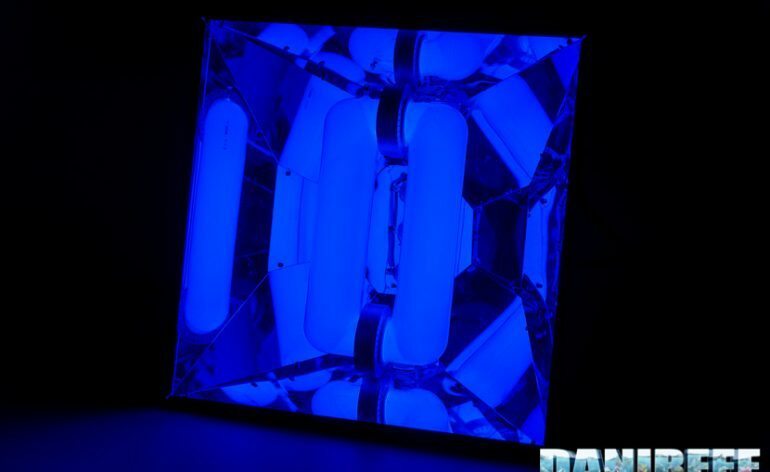 We remind you that we analyzed only the color blue, and we remind that the Lumenarc reflector, the covering is optimal until 60×60 cm, and acceptable until 80 cm. For comparison we can say that the Orphek Atlantik V4, that we have tested some days ago, in the channel two has a blu spectrum that gave respectively 686 PAR with 85 watt of consumption with a smaller covering. On which aquariums we suggest it? Well, the ceiling light of we’re talking about, this blue, can be suggested only for particular aquariums with LPS corals, or for who loves this tonality. Sure, even for certain SPS, even if in this case there are other solutions, always from H.V. Innovation, that have half blue and half white pipe. This is the best solution for certain demanding corals. As we have already said the ceiling light by H.V. Innovation da 18.000°K emits only blue light, for this reason is pretty complicated compare it to other full spectrum ceiling lights. The H.V. 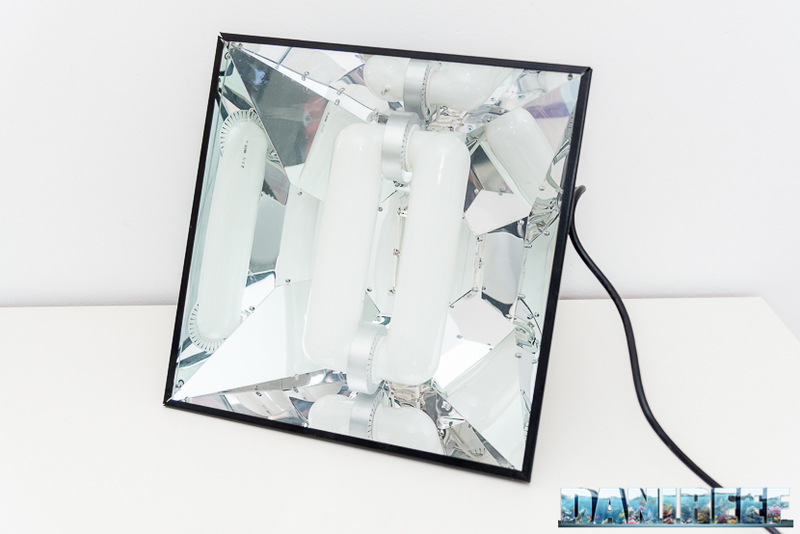 Innovation lamp of 18.000°K and 80 watt, like the one we can see in the pictures and that we’ve tested, costs 499 euro and 699 euro with the Lumenarc reflector. That we suggest, by the way. 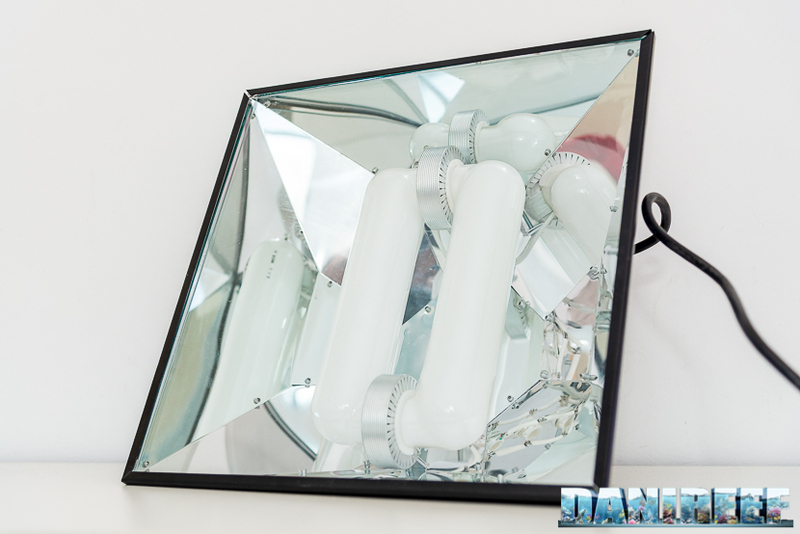 The 150 watt costs 599 euro and 799 euro. 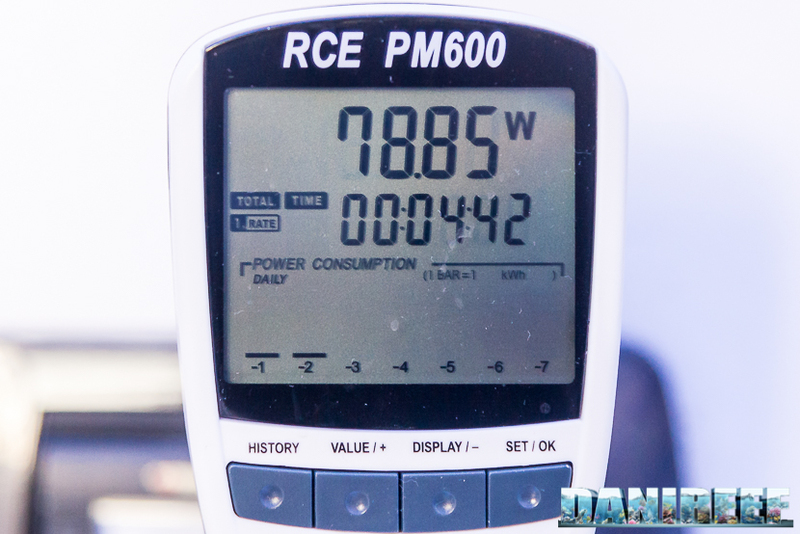 9 hours of functioning, with an energy costs of 0,27 euro/kwh it will have an annual consumption of 70 euro. 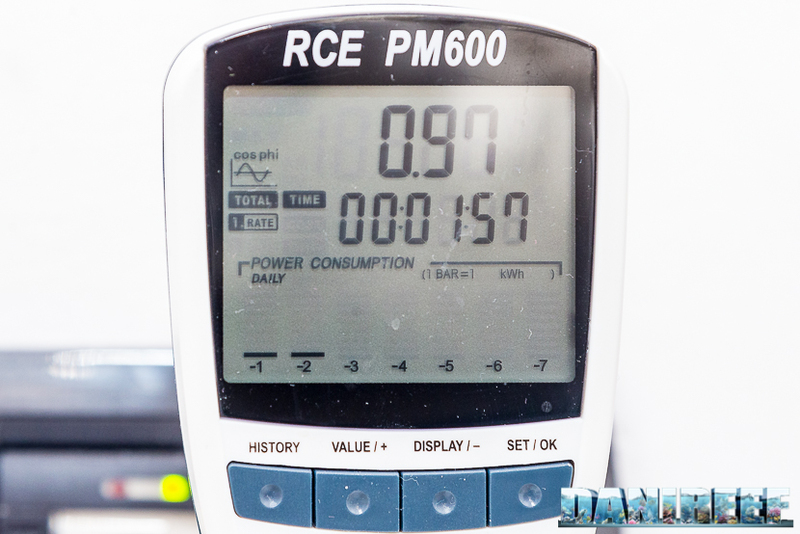 The absorbed power is 79 watt, so a relationship price/watt would be 8,9 euro per each watt. Surely the ceiling light 150 watt it’s cheaper with 5,3 euro per each watt. If you want a comparison with the other ceiling lights we had in our hands it’s enough refer to the chart below. But remember that the covering is extremely different for these H.V. Innovation ceiling lights. The ceiling light proposed by H.V. Innovation is incredibly interesting, the covering is extremely wide and the adjustments are void. The cost per watt is slightly high, even if is justified by the covering, but we can’t say about the measured PAR due to the particular spectrum of the ceiling light. 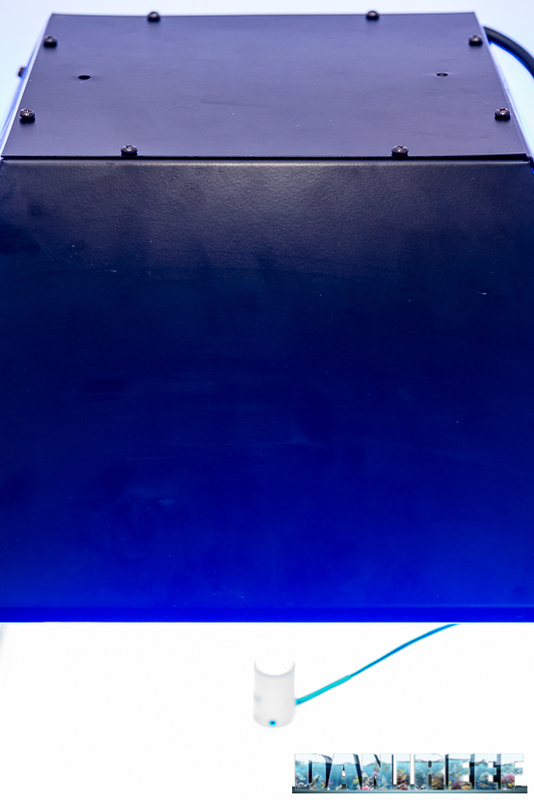 We’re waiting for a white version/white and blue version, maybe of 150 watt, for our future tests. Question and comments, as always, are welcomed.